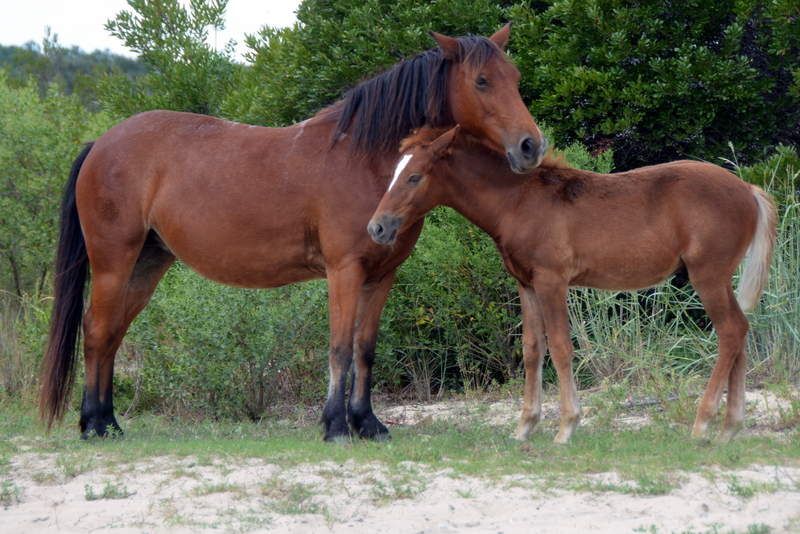 It’s been awhile since I’ve shared photos of my the Corolla wild horses, so today’s the day. The ultimate thrill is to see them down by the ocean, second “prize” is to spot them on one of the dunes. But, even when they’re not in either of those places, it’s still possible to get some good shots. 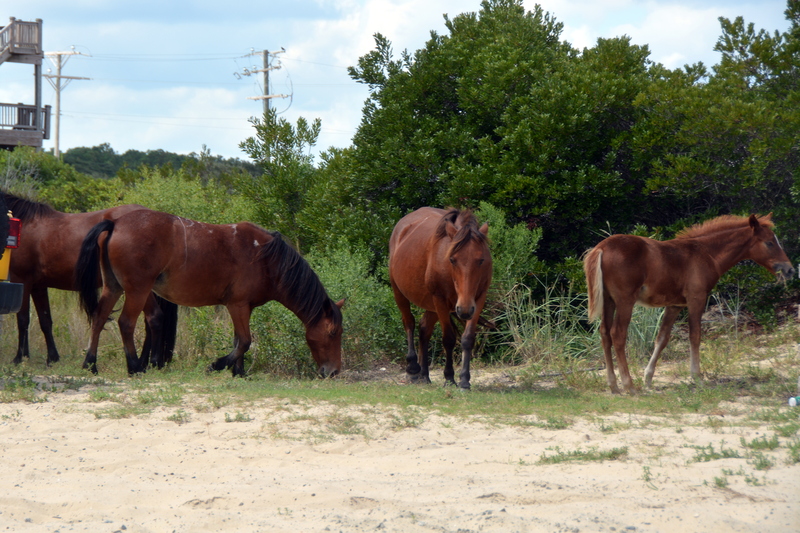 We saw this group “hanging out” near one of the beach houses on one of our recent trips. Shortly after I took that photo, I noticed the mom and little one (far right) nuzzling. But, for awhile, it seemed that either the other horses kept me from getting a good picture, or Mom was blocking the little one’s head. Finally, my patience paid off, and I got the picture I wanted. …just to the other side of the beach house, where they continued with the cuddling. 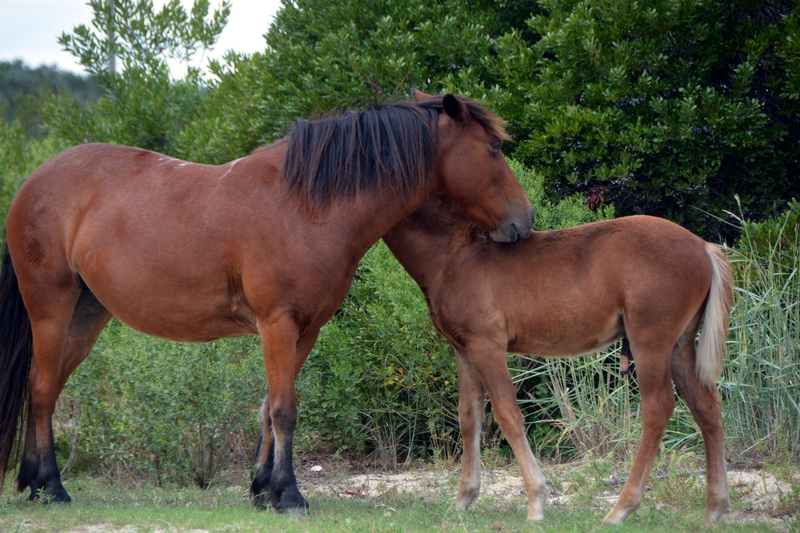 It was a sweet moment between mom and babe that I was pleased to capture. 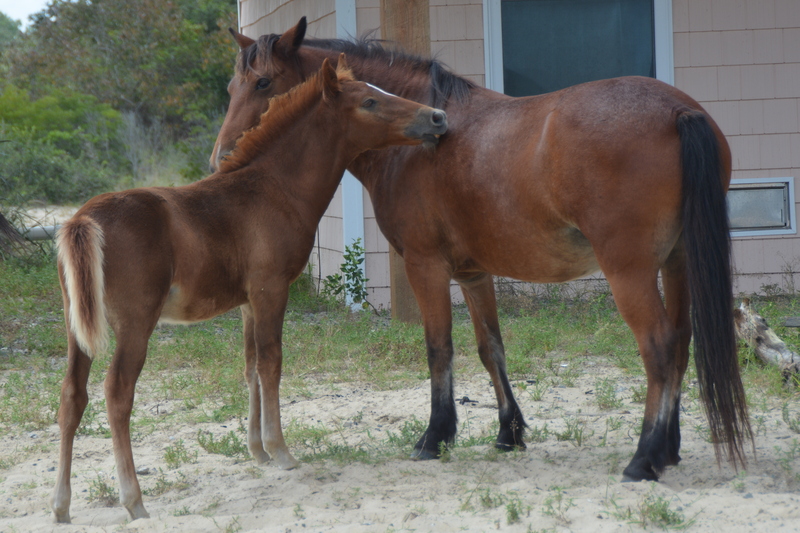 This entry was posted in OBX Wild Horses, Traveling Days and tagged corolla wild horses, wild horses of the obx. Bookmark the permalink. Lovely images – thanks for sharing! How sweet! That little horse was definitely smiling for you! Awww! Great photos. Parenting at its best. How I love your Coirolla horse photos! These of the Mom and baby cuddling are just priceless. 🙂 Thank you. 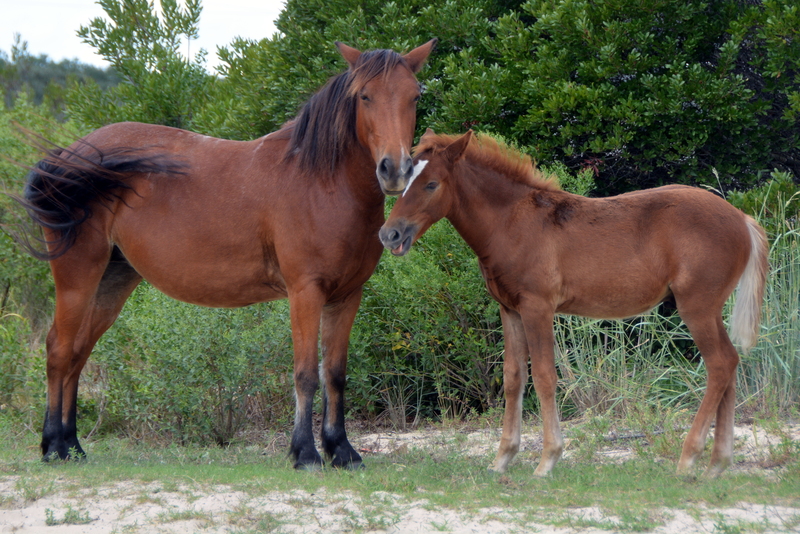 Happy horses on the beach……and Moms with their little ones ALWAYS make for a great photo capture! You were at the right place at the right time to capture these! pic 6 … sorry ! 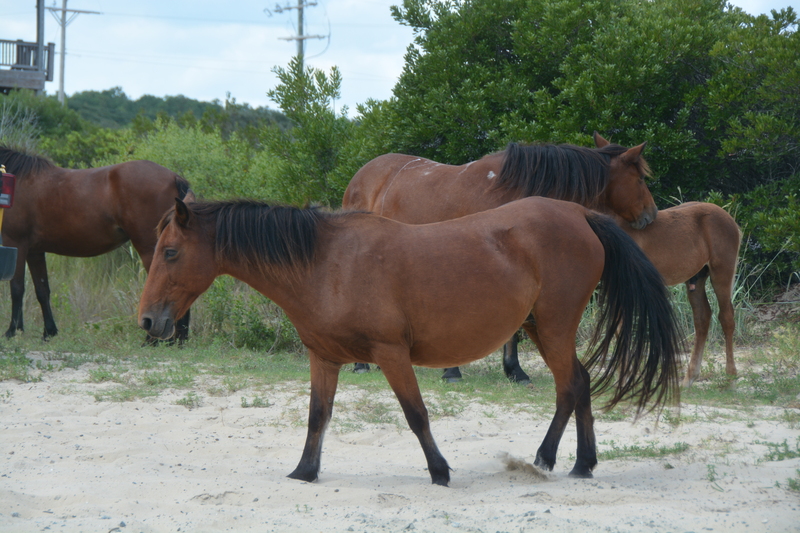 What an exciting visit to see the Corolla horses. Thanks for sharing them with us. It is always a treat to see them. Sweet mother and babe shots. It’s one thing to be in the path of a startled squirrel, but a charging horse is downright scary. Glad you were safely inside! What beautiful horses, Dianna. The colt is precious. Chuck and I are spending a few days this week at our friends house at Corolla. The horses are all around their cottage can’t wait to see them and take pictures. Will post on Facebook when we get back. 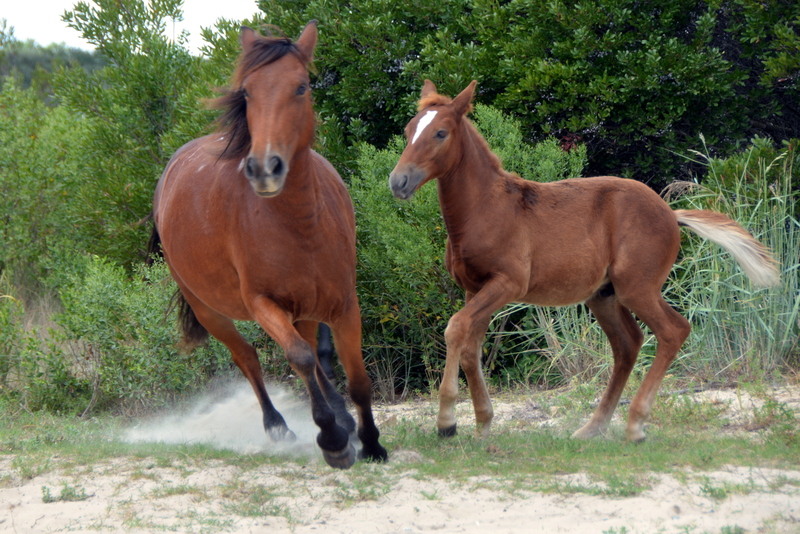 Wonderful photos–every time I see you pictures of the wild horses I’m amazed by how beautiful they are.